It’s been cold and rainy recently here in Arkansas, but summer is coming. So it’s the perfect time for a warming, but lo-cal vegetarian soup. The combination of root vegetables makes the soup sweet, and it is creamy and satisfying from a touch of butter in the base, although it has no cream itself. You’ll still fit in your swimsuit this June! This soup takes about 25 minutes to cook, once everything is chopped. Try to chop everything about the same size so that the vegetables all cook in the same amount of time! Tip: You can chop the butternut squash, sweet potato and carrot in advance and keep it in your freezer in large gallon sized freezer bags. The frozen vegetables will cook in the same amount of time as fresh vegetables would, so long as they are chopped relatively small (like in nickel-sized pieces). 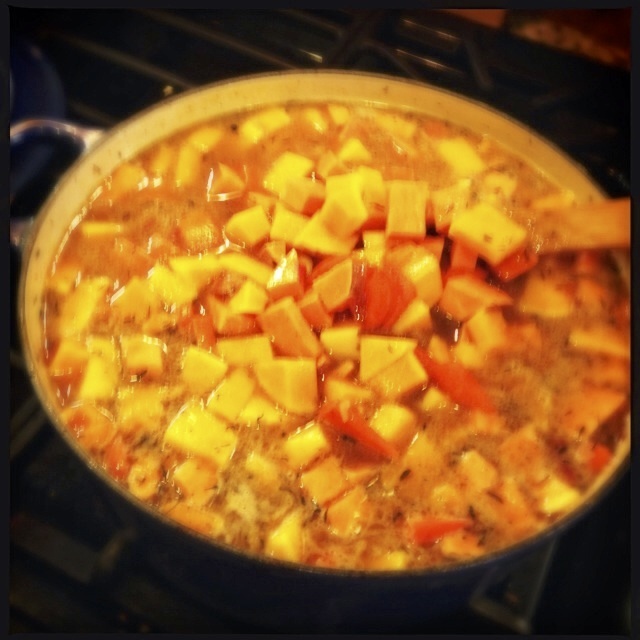 Add the chopped butternut squash, 1 large chopped sweet potato and 2 large chopped carrots, 1 C apple cider, 32 oz. vegetable stock, 1 T chopped fresh ginger (from a jar is ok; the best way is to grate it on your microplane grater straight into the pot) and 1 T thyme (if using fresh thyme, tie together three sprigs or so with kitchen twine and tie the other end to the handle of the pot). Add enough water to cover the chopped vegetables. Farrah is never allowed on the counter. Bring to a boil, then simmer until the vegetables are cooked through. If the thyme was fresh, remove it from the pot and discard. If you used dried thyme, no worries, just go to next step. Insert your immersion blender and blend until everything is nice and smooth. If you don’t have an immersion blender, you can blend it in small batches in your regular blender. It will be hot and will want to escape from the top of the regular blender, so go slow and blend in small batches! Add salt and pepper to taste. (You are looking for balance, not “super saltiness” or “hot pepperiness”). If you want extra creaminess, you could put a dash of cream on the top of each bowl. Don’t add it to the pot; it will get lost unless you add about a quart of cream. And that is not good for fitting into a bathing suit. But, oh, it is delicious that way. If you want to serve this with wine or beer, I like this with a nice New Zealand Sauvignon Blanc from the Marlborough region (anything in the $10-$20 range would be great). Or serve it with a cold wheat beer. Or just serve it however you like! 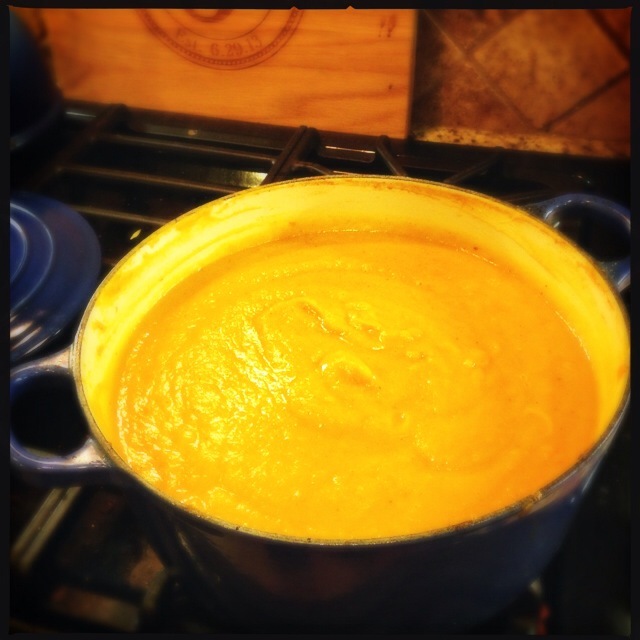 This is a quick and easy vegetarian soup made from sweet root vegetables. It is creamy without cream, and only has a touch of butter in it. 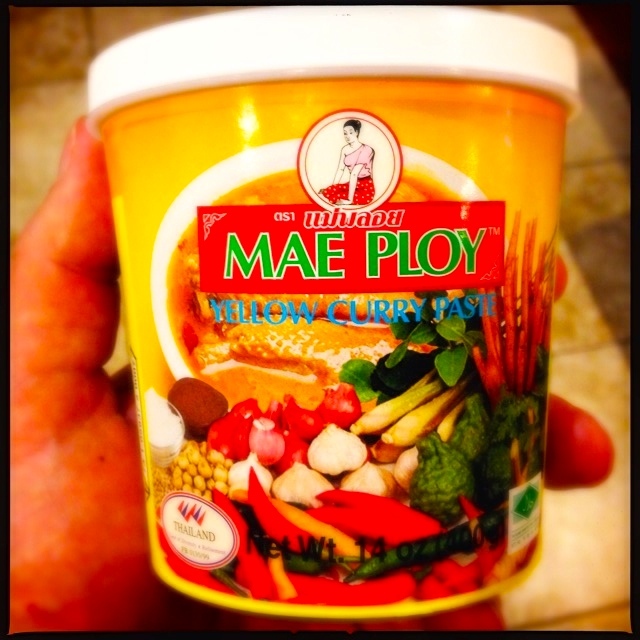 If you have any yellow curry paste, that will add a little bit of heat, and a nice savoriness that works well with the soup. Serve with a Sauvignon Blanc or a wheat beer. Bring to a boil, then simmer until vegetables are cooked through. If the thyme was fresh, remove it from the pot and discard. If you use dried, no worries, just go to next step. Insert immersion blender and blend until everything is nice and smooth. If you don't have an immersion blender, you can blend it in small batches in your blender. It will be hot and will want to escape from the top of the blender, so go slow and blend in small batches!